AutoCAD software, the world's leading customizable and extendable CAD application, lets you design, visualize, and document your ideas clearly and efficiently. 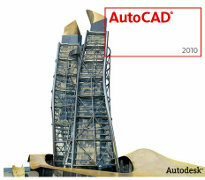 With AutoCAD 2009 3D CAD software from Autodesk, you'll move to new highs of productivity. New software features accelerate tasks, allow commands to be easily found, and help rapidly train new AutoCAD users. AutoCAD is the ultimate CAD design software for working with 3D models. With the ribbon interface, overall drafting productivity is increased as the number of steps to reach a command is decreased. The ribbon interface presents command options in a concise visual format, allowing you to quickly select commands based on the work you're doing. Moving between applications is now quick and intuitive. The ribbon is both customizable and expandable so that it can be optimized for each user and meet each company's standards. The ViewCube is an interactive tool used to rotate and orient any solid or surface model in AutoCAD. Selecting a face, edge, or corner of the cube brings the model quickly to that predefined orientation. Clicking and holding the ViewCube allows the model to be freely roated in any direction. Since the cube is in a fixed location on the screen, it provides at-a-glance orientation. The ViewCube will be introduced in all Autodesk products as a common tool for working with 3D models. In addition to allowing quick access to the orbit command, the new SteeringWheels tool allows quick access to the pan, center, and zoom commands. The SteeringWheels is highly customizable so you can add walk through commands to help create and record a walk-through of your model. Reviewing and working with several files is no longer a tedious and time-consuming process. The new menu browser interface allows you to browse files and examine thumbnail images and provides detailed information about file size and file creator. Plus, you can organize recently used files by name, date, or title. The new action recorder saves time and increases productivity by automating repetitive tasks without requiring the skill or assistance of a professional CAD manager. Users can quickly record a task, add text messages and requests for input, then quickly select and play back recorded files. The new layer dialog makes creating and editing layer properties faster and less prone to error. Changes are instantly reflected in the drawing as they are made in the dialog. The manipulation of the dialog box has been simplified, and columns in the dialog can be individually resized so the contents of that column or its title are not truncated. Individual columns can be fixed in place so that the rest of the columns can be scrolled through and referenced to a fixed column such as the layer name. The easily customizable quick properties menu increases productivity by reducing the steps to access properties information, ensuring that information presented is optimized for that particular user and project. The quick view feature uses thumbnails instead of file names, making opening the correct drawing file and layout faster and decreasing the time spent opening incorrect drawing files. · 1,280 x 1,024 32-bit color video display adapter (true color) 128 MB or greater, OpenGL, or Direct3D capable workstation class graphics card. · For Windows Vista, a Direct3D capable workstation class graphics card with 128 MB or greater is required. You cannot download any crack or serial number for AutoCAD on this page. Every software that you are able to download on our site is legal. There is no crack, serial number, hack or activation key for AutoCAD present here. Our collection also doesn't contain any keygens, because keygen programs are being used in illegal ways which we do not support. All software that you can find here is freely downloadable and legal. AutoCAD installation package is prepared to be downloaded from our fast download servers. It is checked for possible viruses and is proven to be 100% clean and safe. Various leading antiviruses have been used to test AutoCAD, if it contains any viruses. No infections have been found and downloading AutoCAD is completelly problem free because of that reason. Our experts on malware detection tested AutoCAD with various spyware and malware detection programs, including fyxm.net custom malware and spyware detection, and absolutelly no malware or spyware was found in AutoCAD. All software that you can find on our servers, including AutoCAD, is either freeware, shareware or open-source, some of the software packages are demo, trial or patch versions and if possible (public domain licence), we also host official full versions of software. Because we want to be one of the fastest download sites on the web, we host all the software including AutoCAD on our servers. You cannot find here any torrents or download links that would lead you to dangerous sites.